Race organizers are hoping the shirts help spread a positive image for the city and turn frequent racers into running billboards as they travel throughout the country for future races. 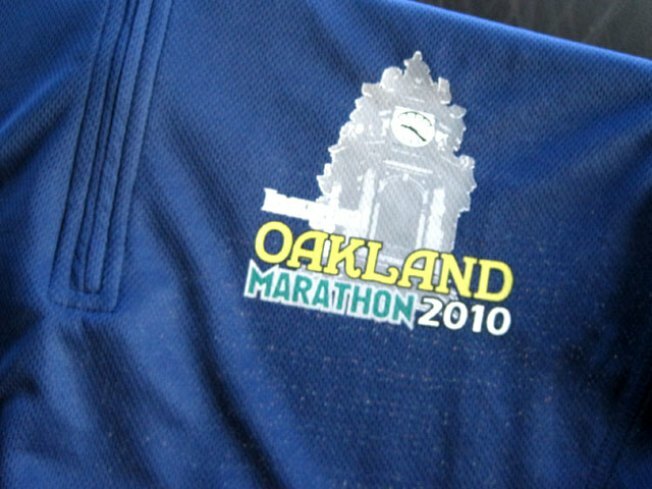 Thousands of people will be in the East Bay this weekend for the Oakland Running Festival. More than 6,000 people are expected for Saturday's 5k and Sunday's half-marathan and full marathon. Several organizations united to raise enough money for the races -- the first major running event for the city in 25 years. Bands and musical acts will entertain all weekend. Participants will be given a running shirt with their registration. Not just some T-shirt, these long-sleeved tops are made of material that help runners keep cool while looking good. Organizers are hoping the shirts help spread a positive image for the city and turn frequent racers into running billboards as they travel throughout the country for future races. The route starts at City Hall at Frank Ogawa Plaza on Broadway and winds through several neighborhoods, including Chinatown. The final lap wraps around Lake Merritt before the home stretch to the finish line at City Hall.